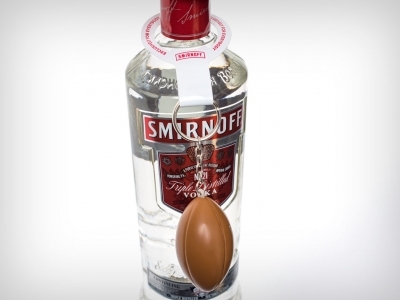 When Smirnoff wanted to draw attention to their Triple Distilled Vodka during the fall football season, they selected Do-It Corporation to design a hanging solution for their football keychain giveaway. Do-It’s 2-DNR Bottle Neck Hang Tab provided a clean, attractive, and simple way to hang the keychain around the neck of their 1-liter vodka bottle. The attached football was easily noticed by customers. Do-It Corporation’s contract assembly area attached the keychain to the printed bottle neck hang tab. All Smirnoff had to do was hang the promotional device over the cap of the bottle.